And so when you ask about the importance of having a woman president, absolutely it’s important, for, yes, symbolic reasons—symbols are important; it is important who and what we choose to elevate, and to celebrate. And one of our core values in this country is that we are the land of equal opportunity, but when equal hasn’t yet included gender, there is a fundamental challenge there that, I believe, having our first woman president—whenever that is—will help resolve. And do I think it would make a substantive difference? 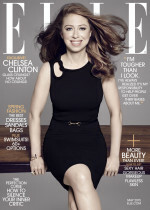 Yes, we’ve seen again and again, when women have been in positions of leadership, they have had different degrees of success versus their male counterparts, historically being able to build more consensus so that decisions have longer-term effects, whether in economic investments or in building social capital. Who sits around the table matters. And who sits at the head of the table matters, too. 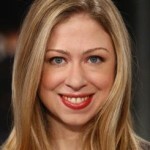 Mezvinsky and Clinton welcome their baby daughter, Charlotte Clinton Mezvinsky, at 7:03 p.m. at Lenox Hill Hospital in New York City. Not surprisingly, the first thing I noticed was his height…The second thing I noticed was his kindness off the court — and his fierceness on it. Kindness to his friends, his family and fans. Fierceness in his drive to win. Jason has always been focused on others, on what’s right for those he loves, and on helping those whose jersey is the same as his. We have to realize that this is Hillary Clinton, she’s most likely running for president, it hasn’t been good for her. A lot of people say she’s too old. And so, there is coverage. I certainly feel all the better whether it’s a girl or a boy that they’ll grow up in a world with so many strong female leaders. I’ve always known that documentaries are an important vehicle for education. [The documentary] essentially compelled others who viewed it to find themselves within the story. 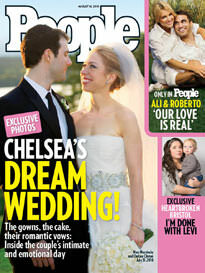 Clinton appears on the cover of People after she weds her longtime love Mezvinsky. Thank you, Thank you. We are profoundly grateful to be surrounded by our family and friends as we begin our new life together.